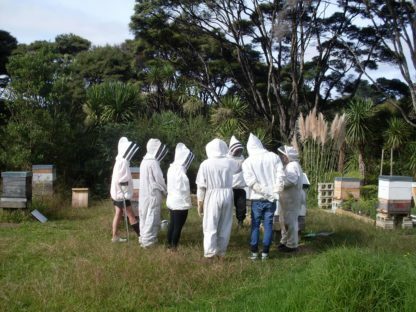 Have you ever thought about taking up Beekeeping, but just don't know where to start?! This introductory 6 hour Weekend Beekeeping Course is based in West Auckland, New Zealand. Please join the waitlist if this is Out of Stock, once we have enough students we will schedule dates for the next course. 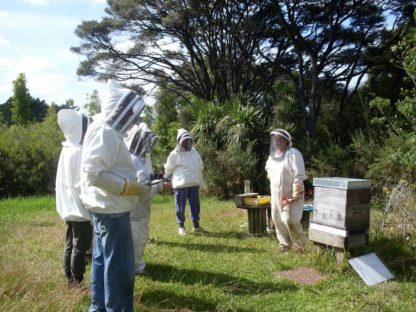 Well, here at kiwimana we are Beekeepers who want to help those interested in Bees and Beekeeping by providing this simple and informative starter course. 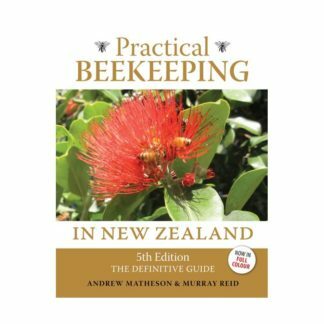 It will give you a great overview of the ‘world of Beekeeping’, a start without Bees, so you can learn about Beekeeping and Bees ‘Hands-Off’. Suitable for those without Bees. 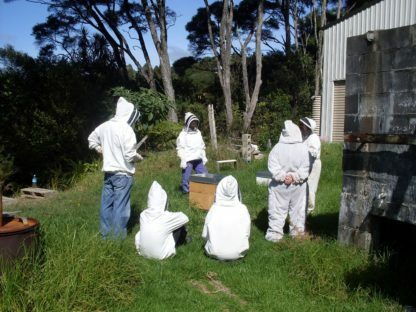 Then an Apiary visit to meet the Bees. Options for basic gear and hive-ware for starting out. Introduction to Seasons and how these affect Beekeeper and Bee Activities. What is Health, Disease and Beekeeper Hygiene? Introduction to What is an ‘inspection? and their purpose. 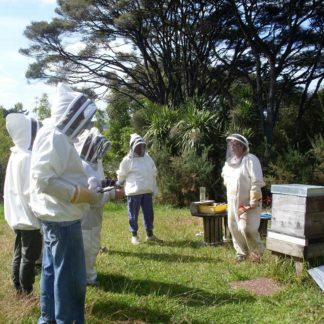 Introduction to Legalities of Beekeeping. To be advised once booking confirmed – located in Waitakere Township, West Auckland. Please arrive on time to take full advantage of Beekeeping course content. You will automatically be booked into the course as dated, when you confirm your order by payment. Thanks for choosing kiwimana to explore a start to your Beekeeping Adventures. An excellent course for a beginner. I have no experience with bees and now feel confident enough to begin keeping bees. Margaret delivers the course in a carefully structured manner, answering any queries as she goes. 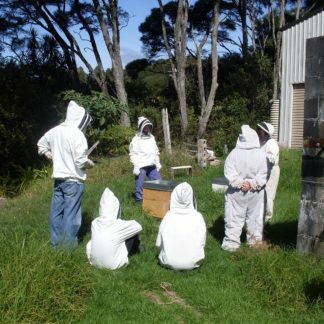 The course ends with a very good apiary visit, allowing you to look inside the hives and identify aspects which have been discussed earlier in the course. Great course content & well presented. It have me enough info to feel confident with my next steps with bee keeping. Great job Margaret! An excellent course and Margaret freely gave up extra time on the site visit to discuss beekeeping matters. Provided plenty of confidence. Would recommend this course to anyone just starting out, or like me, a former hobbyist beekeeper who had just a bit of previous experience. Plenty gained from the course. 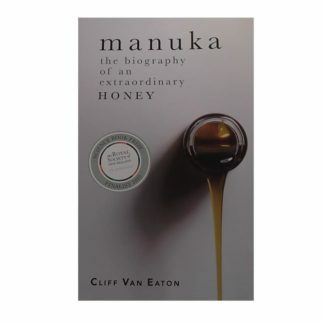 Good introduction to the world of bee keeping. Thanks Margaret for taking us through it. My only negative is that there seems to be a lot more to learn than I realized. Perhaps 3 evenings may work better than 2, with more info especially on the life cycle of the various bees that make up the hive. The Saturday at the hives was very good. This is an excellent course to help people new to beekeeping to learn the basics and build confidence about going forward with the art. Margaret your doing good work with offering this course so thank you for that. highlight was visiting the apiary and practicing a few of the skills required practical for beekeeping. I really enjoyed this course, I learnt so much information that has given me the confidence I need to be a hobbiest bee keeper. If the opportunity arose for a follow on course I would be very keen. I highly recommend this course and I have already recommended it to people I know. I enjoyed good course. Gave good opportunity to use the tools required and experience being near a beehive.